So by now most of you know that I am a fan of Sherry. I’m not afraid to admit it, but in fact, I revel in its meaning. This noble wine that has fallen off the wagon of wine popularity is in my opinion due for a comeback. With wine drinkers everywhere looking to the “new big thing”, I hope that some of you will turn to Sherry for another look. In the myriad of styles and flavors that *Spanish Sherry can be found, I’m sure that if everyone takes some time to explore them, they will most likely find something that they can enjoy and revel in. Be it delicate Manzanilla’s framed by soft salt air, nutty Olorosos that cry out to be consumed with sliced ham, or Pedro Ximenez’s whose syrupy consistency and dried fruit flavors poured over ice cream can bring a grown man to his knee’s, I’m confidante that there is something out there for everyone. In fact there is even a “starter” sherry for all of you who are not quite sure where to start. Cream Sherry, is slowly becoming a lost style. 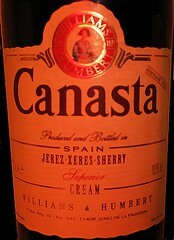 In fact, it has also been the wine blamed by many for single-handedly bringing about the downfall of Sherry. But that won’t stop you from finding one to try. Perhaps the most famous of which is Harvey’s Bristol cream is a standard on almost every wine store shelf. In fact they claim to have invented the style for the sweet tooth that most wine drinkers in Britain displayed back in the 19th century. Most wine drinkers thought that this sweet slightly nutty drink was just the ticket to show sophistication and class. For this reason Harvey’s Bristol cream became one of the biggest selling Sherries for many years. This too is the reason for it’s eventual demise as a new generation of wine drinkers began to demand drier wines with less sweetness. With time this style of Sherry was relegated to the bottom shelf where the likes of Manischewitz and Yago Sant’gria can be found, only to be bought up by old ladies during the holidays. Fast forward to today and you see much of the same occurring. Sadly this one wine has given many the impression that sherry at it’s best is a sweet “grandma drink” forced upon visiting relatives at holiday time. As I’ve said before this is far from the truth. In reality most sherry is dry with two big exceptions, one being Pedro Ximenez and the other being Cream a style that is made by sweetening a dry Oloroso with a touch of sweet Pedro Ximenez. Prime must is used. Controlled fermentation. Blend of Oloroso and sweet wines (Pedro Ximenez). Ageing by oxidation in American Oak 500l. Butts in the Criadera and Solera system. Average aging more than five years. So I thought what the heck, give it a try and see what happens. In truth, I was a bit shocked, I think I liked it! What caught me off guard was its beautiful Oloroso nose. Roasted nuts, dried fruits, and caramel, it was more complex than I was expecting and I went back to it various times just to make sure of what I was tasting. On the downside as much as I enjoyed it I did think the alcohol was a bit out of balance, at 19.5% it seemed to stick out a bit more than I would have liked though I guess if I was in a cabin by the fire, that extra heat might do just the trick to make a long winters night a bit more enjoyable. So today’s lessons: don’t judge a wine by its label, or at least not always and remember Grandma might be onto something! Light brown with intensity and some lightly reddish hints. Hazelnut and chestnuts with light salt air and wood. Medium to heavy on the palate with a strong alcohol presence and high acidity. The sweetness isn’t syrupy but rather light with flavors of caramel, coffee, light apricot, raisin and wood flavors. Actually though the alcohol is rather warm I really enjoy the acidity in this making it feel fresh and alive. Quite tasty for an entry level sherry. *All Sherry is Spanish. If you see something from another place or country that calls itself Sherry, please do not buy it. For one thing, your supporting someone who is corrupting the good name of a Nobel Region. The other reason you should not buy anything called Sherry that is not from Spain, is that in the end, it will never taste as good or be of the same quality. Place matters! Read about it on the Champagne website, and the Organic consumer’s website, and the new Appelation America website.